Amazingly, you can enter up to 6 poems for only £10. All proceeds go to Caris Camden [Patron Sir Andrew Motion]which provides winter shelter for rough sleepers. If you win you will have a perfect-bound pamphlet. For five years the winners’ pamphlets have been published by Ward Wood Publishing, who have, this year passed on the torch to Soaring Penguin Press. Adele Ward, who did a brilliant job of editing Larach has had to pass on the task because of pressure of other work, but will still help promote it. You can check out Soaring Penguins via this link http://www.soaringpenguinpress.com/competitions/ and there’s also information on the Camden and Lumen website, and the Lumen and Camden Facebook page. The winnerwill be given 50 copies of his/her own to read and sell. Profits from the copies held by the publisher go to Caris Camden. So, there you are. You genuinely cannot lose. And it can change your life. Believe me. It truly can. And now, my own salespitch. 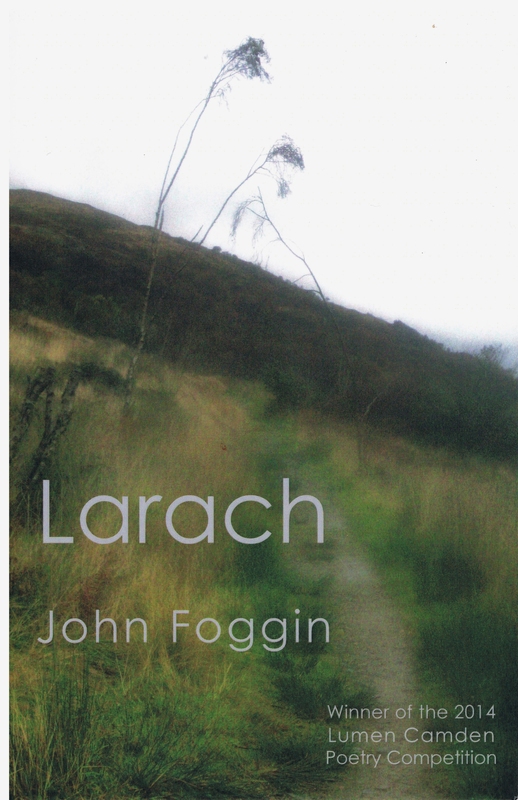 I sell copies of my winning pamphlet ‘Larach’ for the cover price of £5.00, p&p free. £1.00 of each sale will go to the charity. I’m aiming to raise £75 …which involves selling every copy I still have in stock. If you buy a copy, you give a £1 to charity, you get a copy signed and dedicated to your specification AND at the end of the year, I’ll announce, via the cobweb how much we’ve raised AND I’ll thank everyone of you personally. So how easy is it to buy Larach for one you love? Go to My Books at the top of the page. There you’ll find a PayPal button, You won’t even notice you’ve paid, you’ll be doing someone a good turn, and you’ll have bought a handsomely published book of poems which will drop through your letterbox a couple of days later. There you are. Enter a competition. Buy a book. Give people presents. You know you’ll feel good.